Find Fresh Digs and many other vintage and handmade pop-ups at the Spring Hobnob Market! Join us for our quarterly nonfiction book club! This quarter we’re reading The Greatest Love Story Ever Told by Nick Offerman and Megan Mullally. Pick up your copy of either the regular, large print or electronic version at the Effingham Public Library. Feel free to bring your own snacks and drinks to share! 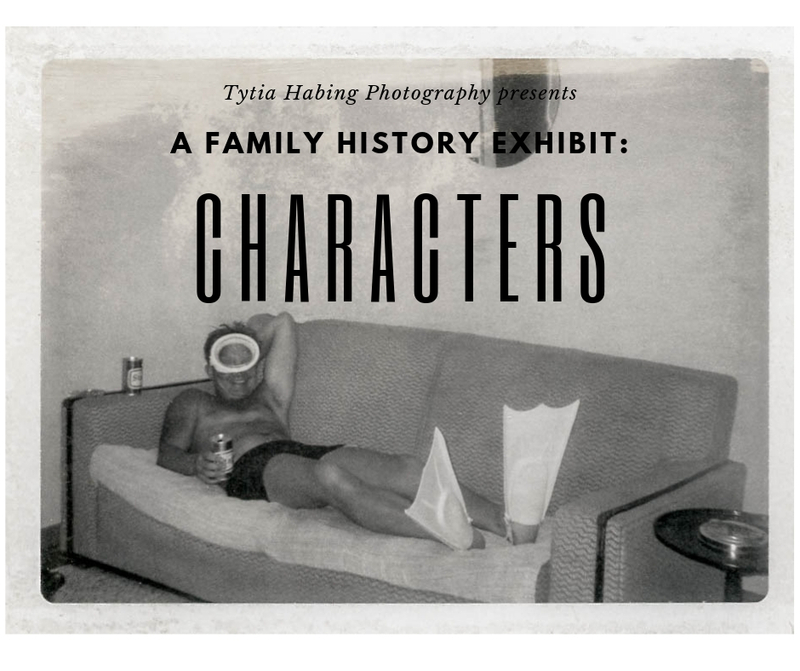 If you follow Watson, IL photographer, Tytia Habing, on social media then you were recently privy to some of her great family photo finds as she scanned and saved thousands of old family photos in what she referred to as The Great Scan of 2019. While she didn’t take these pictures, she did hand-pick them and with her engaging storytelling she filled us in on the rich characters behind these images. From a super-buff great grandpa (who “wasted” film on animals) to monkeys in the Rosalyn Cafe to child labor in Indiana and to nuns in wooden speedboats, the characters in these photos all tell her family’s story. Join Tytia and her family photo and storytelling exhibit at Fresh Digs during Artisan Fair weekend in downtown Effingham on Saturday, May 4 from 10 am to 3 pm. You may even get to chat with Tytia and her family. Join us for a His Glories Farm spring plant pop-up! Fresh Digs and the Downtown Effingham Business Group are celebrating women! Ladies are invited to experience downtown Effingham - through shopping, sipping and eating! Other participating stores will offer extended shopping hours and specials while the restaurants and bars will feature drink and dinner specials. Plan to spend the evening downtown celebrating YOU! This quarter we’re reading I’ll Be Gone In the Dark by Michelle McNamara. Pick up your copy of either the regular, large print or even electronic version at the Effingham Public Library. For this quarter's nonfiction book club at Fresh Digs, held in conjunction with Effingham Public Library, we'll be discussing The Light Between Us by Laura Lynne Jackson. "The Light Between Us provides guideposts for living a rich and fulfilling life. In her beautiful worldview, Laura Lynne Jackson reminds us that our relationship to those we love endures across space and time; that we are all connected and invested in one another's lives; and that we are here to give and receive love selflessly. Her story offers a new understanding of the vast reach of our consciousness and enlarges our view of the human experience." Grab your hard copy, large print, ebook or audiobook at Effingham Public Library. In order to have an idea of how many to expect, you can also register at the library closer to the event date. Feel free to bring drinks or snacks to share! Can you believe Thanksgiving is almost here!? Believe it. And that means that Black Friday and Small Business Saturday are here, too. Plan to stay in town and shop locally either next Friday (9 to 5) or Saturday (8 to 4). I know there are out-of-town and online deals to be had and I get it. Just make a pledge to yourself and your community to spend a good portion of your holiday shopping money here. Right here in your backyard where it will be re-invested in so many wonderful ways. I'm going to have bacon jam samples, apple cider (with or without caramel vodka : ), gifts while they last and of course, SALES!! Because that’s what it’s all about, isn’t it? Stay tuned to the Fresh Digs Facebook page because next Wednesday, Nov 21, I'll announce all of the sales!! Remember: Shop small, shop local, shop handmade! Join us and shop locally this holiday season! Join us for our next quarterly nonfiction book club on Monday, August 27 from 6 to 7 pm at Fresh Digs. This quarter we're reading Born a Crime by Trevor Noah. "Trevor Noah’s unlikely path from apartheid South Africa to the desk of The Daily Show began with a criminal act: his birth. Trevor was born to a white Swiss father and a black Xhosa mother at a time when such a union was punishable by five years in prison. Finally liberated by the end of South Africa’s tyrannical white rule, Trevor and his mother set forth on a grand adventure, living openly and freely and embracing the opportunities won by a centuries-long struggle. The stories collected here are by turns hilarious, dramatic, and deeply affecting. Whether subsisting on caterpillars for dinner during hard times, being thrown from a moving car during an attempted kidnapping, or just trying to survive the life-and-death pitfalls of dating in high school, Trevor illuminates his curious world with an incisive wit and unflinching honesty." Grab a copy (regular, digital, large print) at the Effingham Public Library and plan to join us! Fourth Annual Flea Market Anniversary Party! It's time to celebrate four years of Fresh Digs, so that means it's time for the fourth annual Fresh Digs Flea Market Anniversary Party!! That's right, Fresh Digs has been around, thanks to you, for four years! This is how we celebrate! Per usual there will be a flea market in the very back garage area (normally closed to customers) full of all that hasn't been put on the floor, hasn't sold or has just straight up been hoarded. I'm talking about vintage clothes, furniture, discarded art projects, craft supplies, chairs, weird stuff, frames, books, Christmas, new stock that didn't sell and so much more! This is a great big purge, so it'll all be priced to move! Plus the Backroom will get a total makeover with awesome new vintage treasures! If you love vintage, then mark your calendar for this day. Note that that room will be closed from August 6 - 9 and will reopen, renewed at 10 am on Friday, August 10. Plan to be there EARLY for first dibs! Friday will be the start of the flea market and the reopening of the Backroom plus sales store-wide and give-aways. Pop in anytime between 10 am and 6 pm. Saturday we'll open early at 9 am and close at 4 pm. We'll feature live music by The Greyhounds from 11 am to 1 pm and my husband will be grilling up something tasty during that time, as well! Sales and give-aways as a way to say THANK YOU will also be taking place all weekend. Help celebrate four years of Fresh Digs by marking your calendar and joining us! Join us for our next quarterly nonfiction book club on Monday, June 25 from 6 to 7 pm at Fresh Digs. This quarter we're reading Hillbilly Elegy by J.D. Vance. "Shares the story of the author's family and upbringing, describing how they moved from poverty to an upwardly mobile clan that included the author, a Yale Law School graduate, while navigating the demands of middle class life and the collective demons of the past." Artisan Fair Party at Fresh Digs! Make plans to stop by Fresh Digs on May 5! His Glories Farm Perennial Pop-Up at Fresh Digs! Are you ready for color?! Come see all the beautiful early spring perennial colors on Saturday, April 14 from 10 am to 1 pm at Fresh Digs for the His Glories Farm pop-up event! Vanessa will be bringing bleeding hearts, dianthus, lavender, hyssop, hellebores and lots more for your flower beds! Then mark your calendar for Saturday, May 5 (Artisan Fair weekend) from 10 am to 1 pm. Vanessa will be back at Fresh Digs with hanging baskets just in time for Mother's Day gift giving! Join us in reading and talking about our nonfiction pick for this quarter's book club: The Stranger in the Woods: The Extraordinary Story of the Last True Hermit by Michael Finkel. It's almost impossible to imagine living outside and alone, especially at this time of year, but he did it for almost thirty years. "In 1986, twenty-year-old Christopher Knight left his home in Massachusetts, drove to Maine, and disappeared into the woods. He would not have a conversation with another human being until nearly three decades later. Based on extensive interviews with Knight himself, this is a vividly detailed account of the why and how of his secluded life--as well as the challenges he has faced returning to the world." The Effingham Public Library will have copies (print, large print, electronic) available for check out. Go to your library, folks; it's a great place! Show some love to our local artisans this February 16! I've invited all of the local artisans who supply Fresh Digs and you guys with locally made home and gift options to come and hang out and mingle. Here's your chance to put a face and maybe a conversation to the creators of some of our favorites like the leather jewelry, furniture, watercolor prints, painted pieces and more! Follow the Facebook event page to get updates on who will be there and what new goodness they'll be bringing with them! Join LuLaRoe by Kathy on Friday, February 9 from 5 to 7 pm and then again on Saturday, February 10 from 10 am to 2 pm at Fresh Digs! She'll have her special Valentine's Day selection as well as the usual suspects. Find that perfect outfit for your hot V-Day date or goodies for everyday wear. If you've not yet tried out LuLaRoe be sure to stop by and try on some pieces. LuLaRoe sells women's dresses, maxi skirts, pencil skirts, a-line skirts, sheath dresses, tops, leggings and more in an array of vibrant colors and patterns. Many styles have pockets. : ) They also offer a kids' line. Plan to join us Friday night for a girly evening of after hours shopping, sales and snacks! For this quarter's Nonfiction Book Club we'll be reading Stiff by Mary Roach. "Stiff is an oddly compelling, often hilarious exploration of the strange lives of our bodies postmortem. For two thousand years, cadavers-some willingly, some unwittingly-have been involved in science's boldest strides and weirdest undertakings. In this fascinating account, Mary Roach visits the good deeds of cadavers over the centuries and tells the engrossing story of our bodies when we are no longer with them." Copies of the book will be available at the Effingham Public Library. We'll meet at Fresh Digs at 6 pm. Feel free to bring a snack or drink to share! Stop in Fresh Digs for a little LuLaRoe and Christmas shopping! Come to our Holiday Open House on Saturday, November 3! Kay Metzelaars, a.k.a. The Chakra Lady, and I are pleased to bring you a night dedicated to exploring your creativity. Kay will lead the class and during the first half she will teach us meditation - chakra balancing meditation and gazing meditation. The second half of the class will be dedicated to creative self expression. Check her website for all of the details and to register. Early registration ($44) ends September 30. Hurry as space is limited! Chili Fest in Downtown Effingham! When fall is in the air that means Chili Fest is right around the corner! Get ready for a great evening of festivities and fun for the entire family as the Downtown Effingham Business Group hosts the 5th annual Chili Fest 2017 on Friday, October 13th, from 5-8pm. The central location for Chili Fest will take place in downtown Effingham, IL along Jefferson Street and around the old Courthouse Square. Nearly two dozen businesses will offer a chili tasting or other food and refreshment throughout the evening. Chili team participants will be vying for the “Judge’s Choice”, “Spiciest” and the “Most Original” awards. You can also do a little late night shopping and see what the great stores in the Central Business District have to offer! Many family friendly activities are also planned throughout the evening including inflatables and activities for children. Tasting tickets are $5 for 10 tickets and will be available for sale at the event only. Ticket tasting stations will be located at the intersection of Jefferson and 4th Street, Jefferson and Fifth Street, west of Jefferson and Banker. Live entertainment kicks off at 5pm on the Jefferson Street Central Stage. Bring the entire family and Experience Downtown Effingham! Have you dreamed of having Tytia Habing take your photo but just haven't taken the time to seal the deal? Well, now is your chance. Tytia will be offering 20 minute sessions in a pop-up studio in Fresh Digs on Saturday, September 30 starting at 10 am and running until 2:30. For more details and to register go to her website. Don't dawdle, there are only 10 spots! Have you ever wanted to learn how to paint using watercolors? Now is your chance to learn the basics AND get a set of paints and brushes to take home with you! The class will be taught by Whitney Ruger and will take place on Saturday, Sept 16 from 10 am to noon. Cost is $45. Click this link for all of the details and to register. Fresh Digs is pleased to not only set up at the Harvest Market but to also sell tickets for it! If you're not familiar with the Hobnob Harvest Market it's a happy harvest market full of crazy-good vintage & handmade vendors. Fun stuff everywhere you look plus delicious food, a cash bar, live music, and more! All of the fun takes place at the Effingham County Fairgrounds in Altamont, IL. Earlybird shopping at its best! Our quarterly nonfiction book club in partnership with Effingham Public Library will meet a tad sooner this quarter as the Library will be celebrating banned book week with a selection of book discussions around banned books. The next nonfiction discussion will be on The Road to Little Dribbling by Bill Bryson. "Traveling about Britain, by bus and train and rental car and on foot, following (but not too closely) a route he dubs the Bryson Line, from Bognor Regis in the south to Cape Wrath in the north, by way of places few travelers ever get to at all, Bryson rediscovers the wondrously beautiful, magnificently eccentric, endearingly singular country that is Britain." If you've never read Bill Bryson you're in for a treat! Grab your copy in regular, large, audio or even ebook at the Effingham Public Library. Fresh Digs Flea Market Anniversary Party! Plan to help us celebrate our third birthday! This quarter the Fresh Digs' Nonfiction Book Club is reading Pumpkin Flowers by Matti Friedman. It was just one small hilltop in a small, unnamed war in the late 1990s. The hill, in Lebanon, was called the Pumpkin; flowers was the military code word for "casualties." Friedman re-creates the harrowing experience of a band of young Israeli soldiers charged with holding this remote outpost, a task that would change them forever, wound the country in ways large and small, and foreshadow the unwinnable conflicts the United States would soon confront in Afghanistan, Iraq, and elsewhere. Part memoir, part reportage, part history, Friedman’s powerful narrative captures the birth of today's chaotic Middle East and the rise of a twenty-first-century type of war in which there is never a clear victor and media images can be as important as the battle itself. Get the e-book or hard copy at the Effingham Public Library and plan to join us! Downtown Effingham Summer Food Fest! It's that time of year again. Time for the Downtown Effingham Business Group's Summer Food Fest! That means that downtown Effingham businesses will fill the streets with delicious food, drink and live music plus activities for the kids. Plan to come downtown that night and be sure to stroll down to Fresh Digs. We'll be open and we'll be serving up Old Mac's Cinnamon Rolls in the shop: ) Plus we'll be open until 8pm for your shopping pleasure. Join us and create your family's very own Happy Birthday banner! We all know and love the Hobnob series of markets. This will be the first year that the Hobnob Spring Market will be at the Effingham County Fairgrounds in Altamont, IL. Mark your calendar, tell your friends and plan on being there! Our friends Mary and Sarah from the Crafted QC in Davenport, IA will be in town for the Hobnob Spring Market and we thought that while Mary and Sarah are in town maybe they could offer you all a fun class! Remember grandma's button box? It's like that, but multiplied by a thousand. Learn a little button history and let Mary and Sarah teach you how to make your own hand-pressed, fabric covered buttons! Finish out your design with a variety of vintage buttons (including Mississippi River pearl buttons) and trinkets from our stash. Tip: Have your own fabric, sentimental vintage fabrics or buttons? Bring 'em with! Thin fabrics work best - think quilting cotton and handkerchiefs. Buttons 1/2" in diameter are ideal. Register here for their $30 button bracelet class where you'll make your very own button bracelet all while laughing it up with these two hilarious ladies. The class will last two to three hours. Plan to make it a crafty girl weekend and start it all off with this class!